This has been up before. I still like the quite nature of this piece and thought it would make a nice reminder of the kind of large paintings I still want to do. SPECIAL NOTE: Tonight's my "Angel and Machinations" opening. I'll get some snaps from the show and share them in a day or two. Should be interesting. Have a great and successful show, John. I look forward to see the pictures from your show. Have a good one! Can you say that at an art show? Just got back. Turned out good. Details soon. VERY SUBTLE in how you actually incorporate it into the image. I love, though the chick should be naked, and have bigger hooters. I don't like breaking the wall, so I just ride the fantasy. No offense john, but I don't want to know anything about you, I'm happy just looking at the pretty pictures. Hope the show went well!!!! John, I like this. 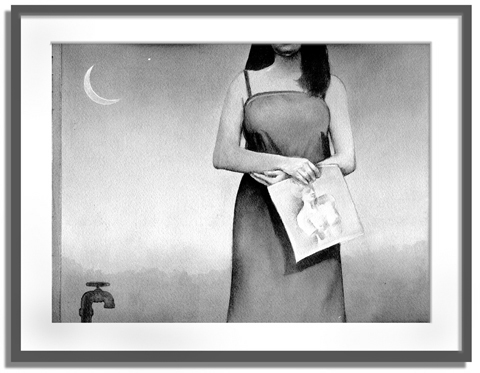 Ok, I get the moon and the star, the babe and the picture of de Milo... but what's the significance of the water faucet? Just a rural detail.......or the symbol for the cosmic soul that is interwoven through all sentient carbon-based lifeforms. Sometimes a faucet is just a faucet. This page contains a single entry from the blog posted on March 7, 2009 4:44 PM. The previous post in this blog was Rush Limbaugh. The next post in this blog is A gorgeous night in Decatur.